Romantic ambience - exceptional living. The spacious 3-room apartment 'Im Obstgarten' is, as the name suggests, in the middle of an orchard with over 100 partly old fruit trees on the outskirts of the village Lorenzenberg in Aßling in the district Ebersberg. The bright basement apartment is equipped with high quality, has a terrace and a garden area. Especially suitable for families. 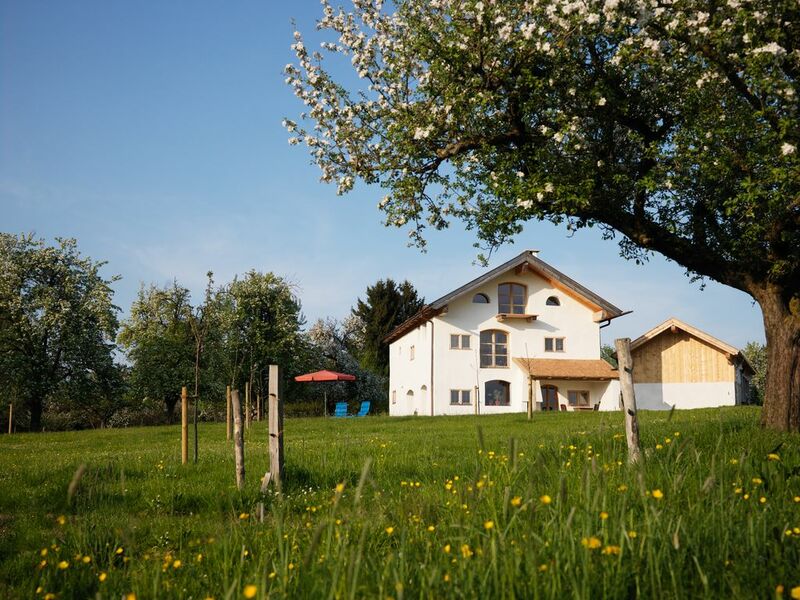 Wonderfully quiet in the beautiful Upper Bavarian Alpine foothills with rolling hills. A very good starting point for Munich but also for the Chiemgau with the Chiemsee and the Bavarian Alps. Nestled in the Bavarian Alpine foothills: The apartment is on the very quiet outskirts of the village Lorenzenberg. This is beautifully located in the southern district of Ebersberg about 28 km east of Munich. The rolling hills around the village are typical of the foothills of the Alps and formed by the last ice age. Despite the rural environment, Lorenzenberg has very good connections to Munich, the Chiemgau with Chiemsee and the Bavarian Alps. The nearby train station in Aßling or the car can be reached in about 30 minutes, the cultural and trade fair city of Munich as well as the idyllic Chiemgau or the edge of the Alps. The small town is therefore an ideal starting point for any holidaymaker who wants to experience both Munich and rural Bavaria. Especially because of our proximity to the trade fair, business people can relax in a calm atmosphere from the strenuous working day. In Lorenzenberg and the surrounding area you will find numerous hiking and biking trails and golf courses. Within 20 km you will find six beautifully located golf courses. The golfer expect next to the active play cozy club houses and restaurants. In the east of Munich there are beautiful hiking trails through the foothills of the Alps. If you want to tackle it more alpine, you are in 30 minutes by car in the Alps. In addition to a heated outdoor pool in Grafing invite lakes in the vicinity (eg. Steinsee in Moosach, Kastensee and Wiesmühle in Glonn) to a refreshing bath. The nearby thermal bath in Bad Aibling invites you to relax. For skiers and runners Lorenzenberg is a good starting point for numerous ski resorts in the Bavarian Alps. The New Munich Trade Fair Center is easily accessible from Landkreis Ebersberg, either by car or by train. Munich, Rosenheim, Wasserburg am Inn, Salzburg, Innsbruck, Bad Aibling. This location was perfect between Munich and the mountains. Our family of 4 enjoyed the gardens, the patio, and the beautiful apartment. Perfect for work and for vacation. We will visit again when we are back! Beautiful property with easy access to many day trips! Our family of 5 was more than comfortable here -- plenty of room and everything you could need! The hosts were friendly and responsive and we would definitely stay here again. We can just recommend this beautiful place. We stayed there for 5 nights with our 3 children and we all enjoyed our stay. Very quiet, very clean. Close to supermarkets and railway station to Munich. An ideal place for a lovely vacation. We stayed here for several nights and made day trips to Munich and Salzburg before heading off along our routes. The place was very clean and modern. The bathroom and shower are wonderful. The owner has handcrafted much of the furnishings and takes great pride in them. The place has two spacious bedrooms (one with bunk beds) and a living area and kitchen. We shopped at a nice grocery store in nearby Assling and made our dinners and breakfasts there with no issues. If you book this fast enough, you might still find the bottle of vodka we accidentally left behind in their freezer! This place was the best we stayed in during our five-week trip around Europe. The location was ideal, the property beautiful & our two year old loved looking at the cows & chooks & playing in the sandpit. The apartment itself had everything we could need & we loved being able to wash our clothes right there. The monsoon shower was a favourite & the beds were so comfortable. Wifi was available for a small fee & we had excellent reception. It was a quiet, picturesque place & in addition, the owners were both extremely friendly & accommodating. They gave suggestions on places to visit & allowed our son to play with many of their outside toys & swings. We couldn't recommend this place highly enough! Very clean & tidy, too! The owners of this accommodation are wonderful. Every attention to detail has been carefully provided with excellent quality fitted rooms, comfy beds and well stocked crockery, utensils and cooking equipment. The cooker is fab & the little efficient miele dishwasher looked after our dirty pots ! The surroundings are so pretty with apple trees and a wonderful view of the Alps in the distance. You could be a million miles away, yet at the edge of the village with the owners family/relatives living in this endearing community. Free parking at the local town & fast train into Munich means you can have both city and countryside. Many thanks for your excellent communication, advice and friendliness. We really enjoyed our stay and wish you all the best for the future. Kind regards, Jill, Gavin & Meghan. Lorenzenberg is beautifully situated in the southern district of Ebersberg about 28 km east of Munich. The small town is therefore an ideal starting point for any holidaymaker who wants to experience both Munich and rural Bavaria. Especially because of our proximity to the trade fair, business people can relax in a peaceful atmosphere from the strenuous working day. Golf: There are 6 golf courses within 20 km. Ski: In only 30 minutes by car is on the Upper Bavarian Alps edge with numerous ski resorts and cross-country ski trails.